There are times when you look forward to something quite a bit. The fact that when you tell others what it is you are looking forward to only to induce a reaction of, "you must be crazy" only serves to make the thing you were looking forward to, even more of a thing to look forward to! The 'thing' I refer to was of course the all night Brompton Monopoly Challenge. All of Saturday I was thinking about what was to come later on in the early hours of Sunday morning. My idea of straw to simply have another all night Brompton ride in London, like Rumplestiltskin was turned into gold by navigator extraordinaire David P. We would travel around as many locations of the Monopoly board we could in the early hours of Saturday night / Sunday morning - in the hope that traffic would be slightly diminished. With Mrs Orange Brompton kissing me goodbye at our doorstep, she left me with the words, "you must be mad!" I thought to myself, am !? I swiftly came to the conclusion that I wasn't but I can understand how one could come to that assessment. The meeting point was McDonalds in the Strand. This branch is open 24-hours a day and seemed like the best start as it is fairly central for some of the other locations on the Monopoly board. I parked a few miles away and met up with Mick B who had done the same. Travelling down to the Strand was fairly easy but even when we set off at 23:30ish it was still busy and London showed that it didn't want to go to sleep just yet. One of the reasons for people saying that I was mad was perhaps due to the recent weather during the preceding days. It has been very cold and Saturday was no exception. Looking at several different forecasts there was a combination of sleet, snow, rain, cloud, low temperatures and strong head winds! It was for these predictions that my Helly Hansen balaclava was packed. This simple addition to my kit list would have some pretty dire consequences...but more of that later on. At the Strand all riders met up and the number of the brave was six. Arriving at the Strand McDonalds at this time of night was quite a sight. Revellers were out in force. Some had only just come out to play while for others it was home time. One 20 something who really should have known better was comforted by her friend - another 20 something. My initial thought was oh dear, like an Adele song there may have been some sort of unrequited love to account for a friendly hand across the shoulders and back. I was terribly wrong! The 20 something I initially thought was a jilted lover bent double and was violently and I really do mean violently sick. The Exorcist was my first thought as the most incredible qualities of fluid exited at speed. Perhaps to console my mild distress thoughts turned for some reason to the words of Alfred, Lord Tennyson but his words altered slightly with the scene the presented itself to me. It was was this point that I again confirmed once and for all in my own mind that I had indeed had a sheltered life! We set off into an early morning London that like the six, was not quite ready to go to sleep. The early morning was bitingly cold and snow and sleet fell for a few hours as we travelled around the various Monopoly board locations, with a temperature not rising much above zero. Out first photo stop was HM Treasury. Dotted along the front of the Treasury building were four of the famous red telephone boxes. That position on the board done we cycled past the heavily guarded entrance to Downing Street, home to the Prime Minister. We said good morning to the police officers on duty and they responded in kind. Luckily the sight of six Brompton bikes lit up like Christmas trees did not arouse suspicion. Classic red phone boxes. Who needs a mobile? Passing back through Trafalgar Square we made are way to a very special location that I was rather pleased to see. Not strictly on the Monopoly Board, Orange Street was lovely and I took several photos to mark this location. I believe it was near Orange Street where yet again my beloved Original Orange Brompton was dashed to the floor like a discarded tissue. All was okay but it is not a sight I welcome! Such a great name for a street! Travelling along the Strand we passed the Central Criminal Courts and eventually we found our way to the infamous Old Bailey, build on the site of the even more infamous Newgate Gaol. We took a few photos but didn't hang around too long just in case! Be good. Be very good! Battling through the cold, sleet, snow and strong winds we reached North London and the Russian WWII tank I first saw on an IBikeLondon ride. Last time it was in the process of being painted and now it looked finished. As we illuminated a nearby tree I suspect we inadvertently fooled a poor innocent Robin that it was dawn. It sang away that familiar song often heard as part of the dawn chorus. Luckily this didn't last too long and it flew away to find sanctuary on the other side of the tank. No it's not dawn yet. Sorry! Crossing over Tower Bridge in the early hours of the morning I expected it to be quiet but it was very busy for this time. This would remain throughout the ride. Reaching Fenchurch Street Station another photo stop beckoned. Soon we took refuge from the cold at the former site of London Electricity Board. No longer used for this purpose it is used occasionally as television and film shoots but will perhaps one day see itself turned into flats. Former London Electricity Board building. We soon arrived at the high walls of Pentonville Prison. This imposing slightly pre-Victorian prison was opened in 1816. It has had some very famous guests staying there: Oscar Wilde; Dr Crippen; John Christie; Boy George and George Michael. It also has a gruesome past insofar as it was an execution site, with its final execution taking place in 1961. Not too far away the Water Company with its elegant frontage has now been transformed into flats. I really liked the doors and frame. 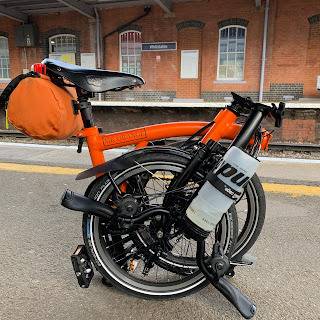 At just over 20 miles we stopped to get warm and collect our thoughts at another station location, this time St Pancras. The station was empty apart from the sleeping, almost zombie-like people perhaps worse for too much drinking, who sat propped up sleeping where they could. For some reason in my search for a toilet I came across this piano. Not sure if it works or why it is there? You hum it, I'll play it. Refueld and warmed we set out into the cold again and headed for our next station, Marylebone. Like so many stations and buildings from the past there is a touch of élan to their construction sometimes lost on modern developments. Before long we reached Oxford Street and I took a picture of Selfridges while waiting at a set of traffic lights. Cycling on Pall Mall and the Mall we stopped at Buckingham Palace as sunrise started to illuminate London for another busy day ahead. Buckingham Palace just before dawn breaks. Passing the Wellington Arch we made our way through Hyde Park. The last time we rode this way was on our first all nighted. Than time it was pitch black. Our final Monopoly destination was Marlborough Street which meant that we had almost done it. Further along the Michelin Building, currently undergoing some restoration looked to me like somewhere I would like to see again when all the scaffolding has been taken down. Fittingly, we ended up with our last photo being of the Brompton Road and the Brompton Oratory. After this we headed back to go - The Strand - and made our separate ways. David P and his partner Anne gave us all a souvenir Monopoly Board and location sheet which was a very welcome and nice touch. (Seen above and below). A big thank you to them and especially to David for organising and navigating a very good ride/route! Mick B, my riding partner iCrazyBee and I decided not to go inside the McDonalds on the Strand and instead made the short journey to an alliterative. There we had a breakfast, chewed the fat for a while before heading for home. It was a demanding ride, mainly due to the weather conditions but I really enjoyed it. Whenever I play Monopoly next I can regale my fellow players with tales from this challenge. My new SealSkinz gloves more than proved themselves and overall were excellent. My Helly Hansen Balaclava on the other hand, worn for over six hours brought about a quite terrible variant of the dreaded 'helmet hair.' Flattened down for tis length of time made my hair take on the appearance of a a marble statue I have seen many times in the British Museum of the Roman Emperor Trajan! When I took this photo, little did I know! First, there were times when I felt cold. I thought I had enough layers on but I should have packed the extra top half base layer instead of leaving it and thinking that I wouldn't need it. I would have had room in the saddle bag and weight would have been almost unnoticeable. Second, my footwear possible caused my toes to be almost permanently cold. They are Merrrell approach shoes with a mesh upper. This allowed the cold air to go straight in. I will have to investigate some cycling shoes that can be used with or are specifically designed to be used with flat pedals. The next few weeks are going to be pretty packed with cycling events and a few other bits and pieces I will let you know about if they come about. The ride data from the ride recorded by my Garmin Edge 200 can be found by clicking on the link below. In addition to the Monopoly Challenge route it also shows the route near to where the car was parked and back again. If you have a Monopoly edition for the city you live in, perhaps you could try something similar?